DAY 18 SUNDAY 14TH OCTOBER. 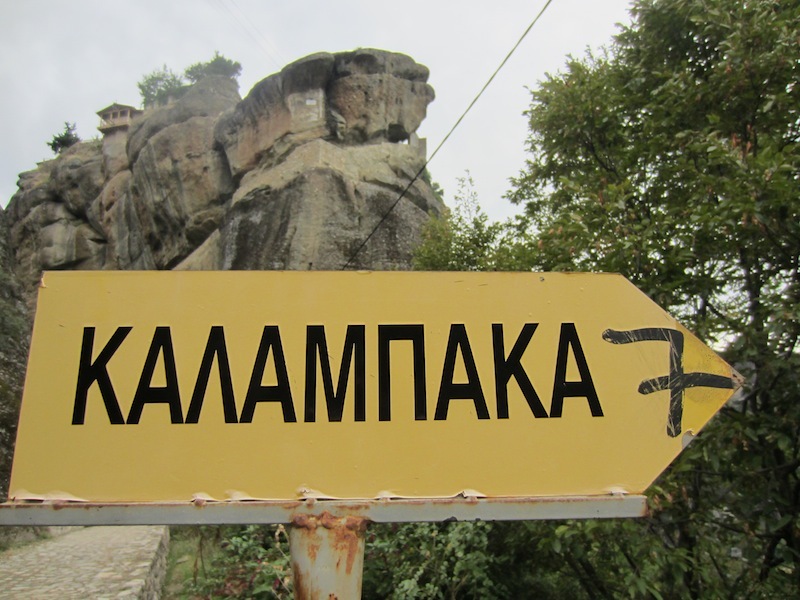 Early morning walk around Kalambaka to a rock ledge overlooking the town. Mid morning trek to Holy Trinity Monastery. 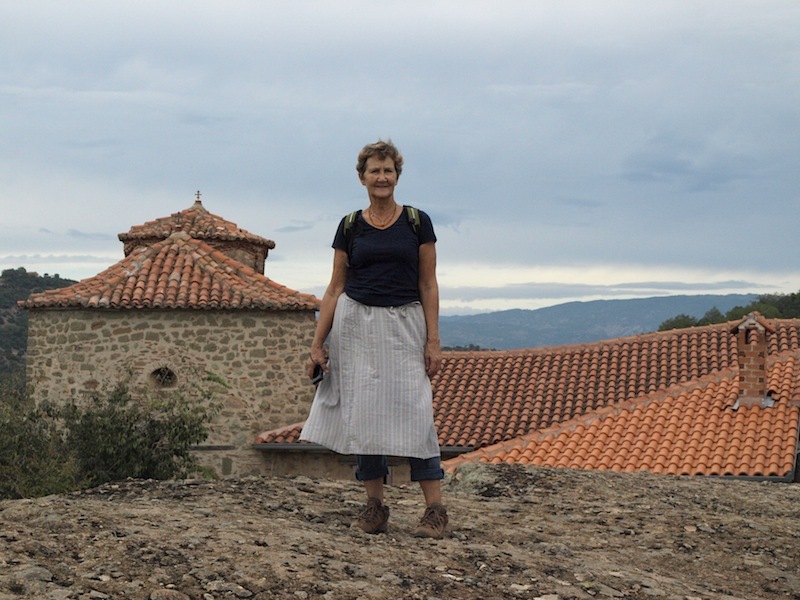 Our first walk this morning was to a ledge overlooking Kalambaka town. We didn’t intend going so far but the narrow laneways and the local churchgoers kept drawing us ever upwards. Being Sunday I thought I should get into the swing of things and go to the church, all we had to do was follow a couple of locals. 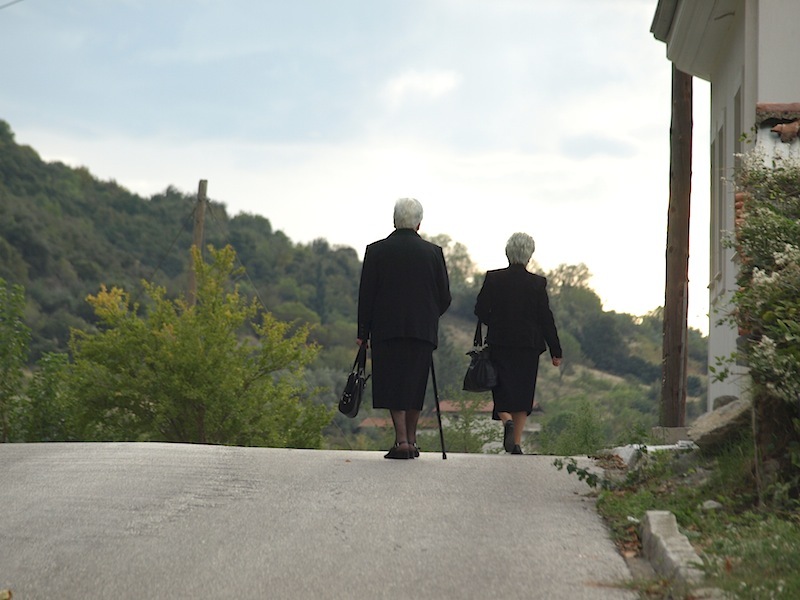 Old ladies dressed in black seemed to be the only churchgoers. Whenever I see old ladies dressed in black I always think of Henry Ford. When Henry’s cars came onto the American market a prospective buyer asked what colours did he have. His reply was any colour as long as it’s black! Nearing the end of the long trek to church. I offered this old lady my arm but she refused. She was probably thinking of what her mother told her as a child: never talk to strange men! At last, the entrance to the church. 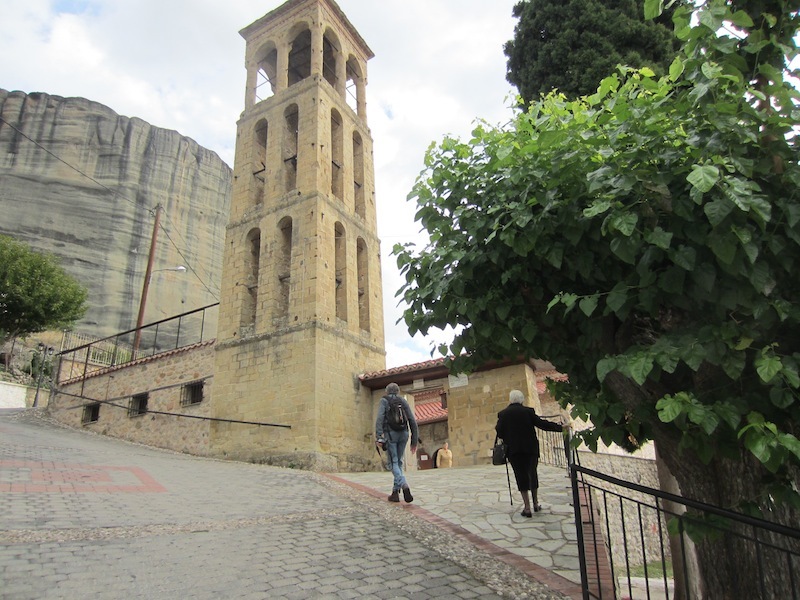 The church the women were heading to was built in the 11th century by the Byzantines. After a while it is possible to recognise different eras of building styles such as Byzantine, Gothic, Renaissance and Italianate. The topic of conversation between Bev and I often relates to what era a building relates to. Boring, you might think, but there is satisfaction to be gained by being able to read a building. 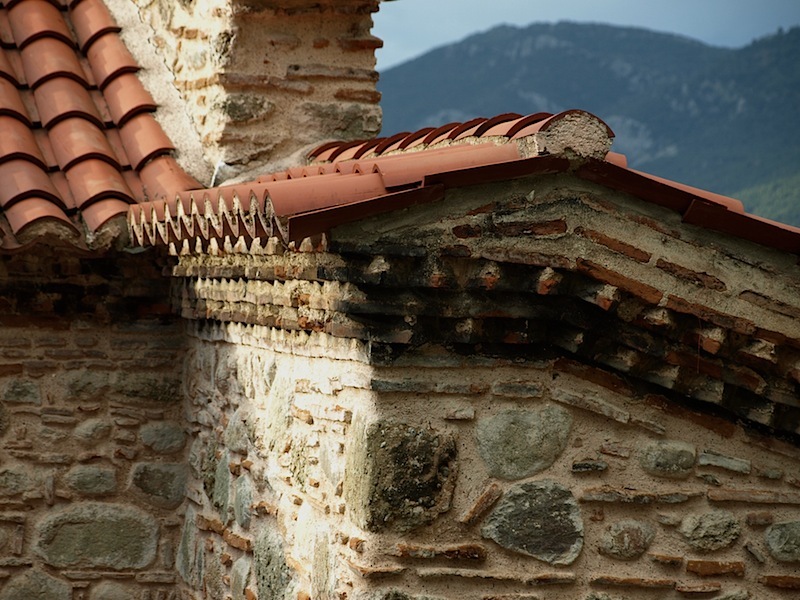 Roof detail of the church. The brick billets under the eves here are not just for decoration. Their outward extension supports the roof and moves the drip line away from the wall. 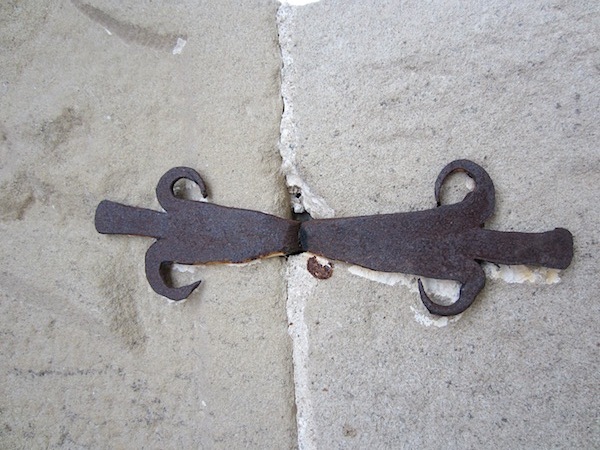 Latch and hinge detail on the outer door of the church. Can you image how this door and fittings looked on the day it was installed. 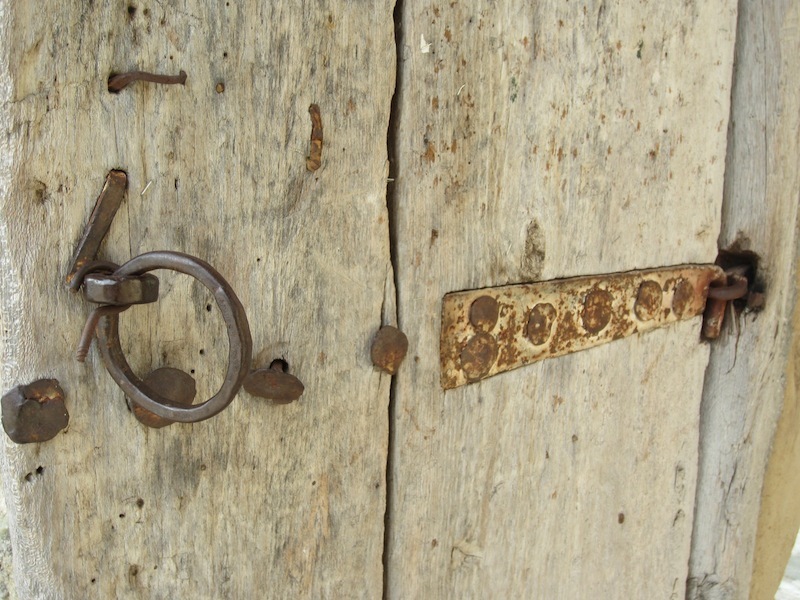 I ask how many people have turned the latch ring. And how many people’s DNA has been laid onto the ring. I couldn’t resist adding my DNA to the thousands before me. I also wanted to see if it still worked and it did. The view from a rock ledge. From the distance last night I thought the rock formations were granite intrusions. This morning I realised they were sedimentary deposits. This makes the geology of the area even more amazing when you think these mountains were once under water. Rooftops on the way back to our hotel. Not all roofs are in as good as condition as this one. 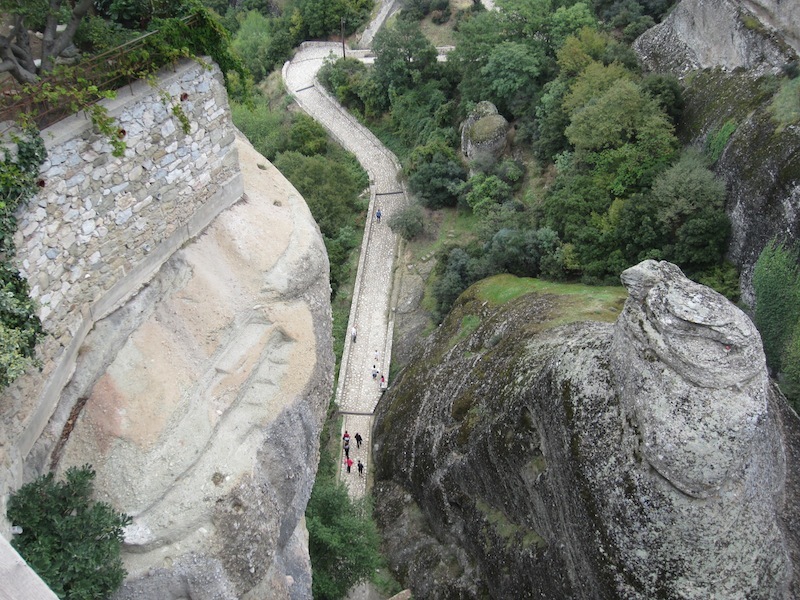 The track at the beginning of the climb to the Holy Trinity Monastery. The trek to the Holy Trinity Monastery involved a very serious grade upwards of seven kilometres through a beech-like forest. Due to the steepness and the awesome scenery we stopped a few times for a breather. 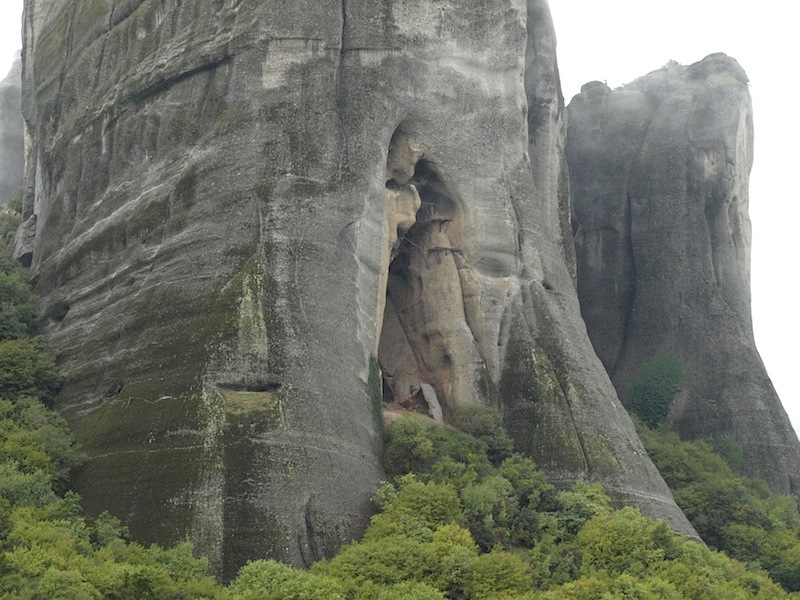 Monks established themselves in caves at the base of the pinnacles near Kalambaka and Kastraki (a smaller town nearby) back in the 9th century. 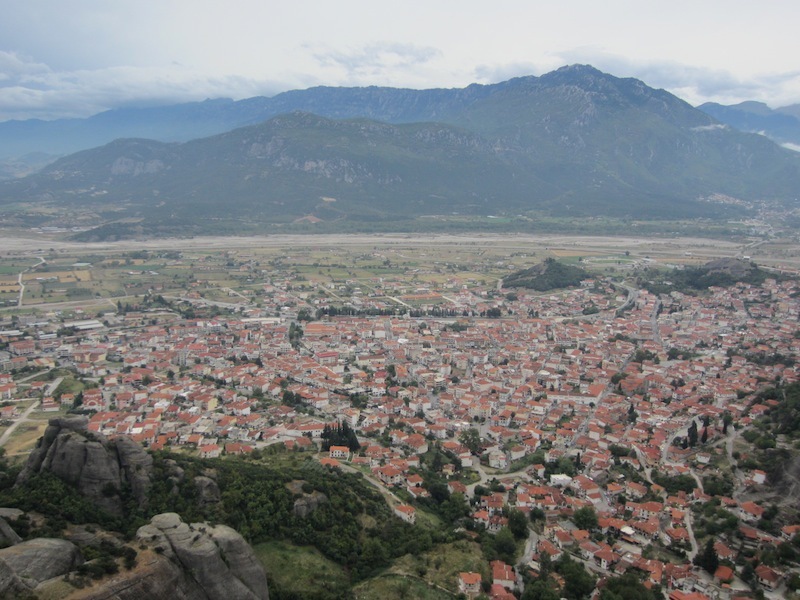 However by the end of the 12th century Turkish raiders were harassing them so they headed further up towards the heavens and built a total of twenty monasteries on top of the pinnacles including the one we visited today. 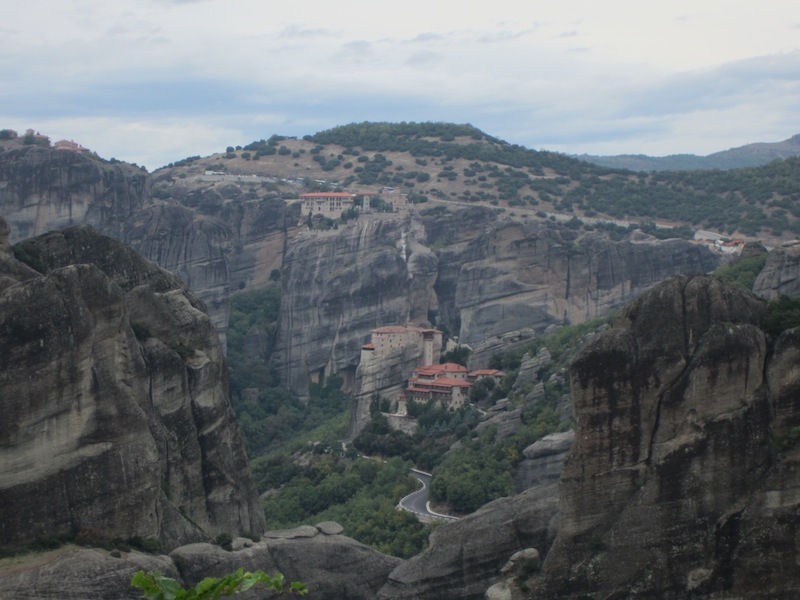 Of the twenty original monasteries built only six remain intact. 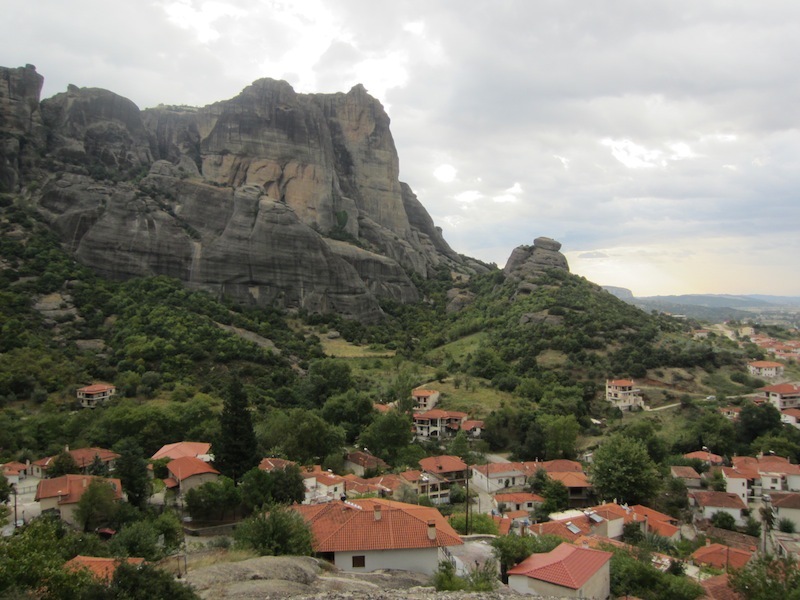 The region is called Meteora referring to the fact the monasteries are up where meteors fly. 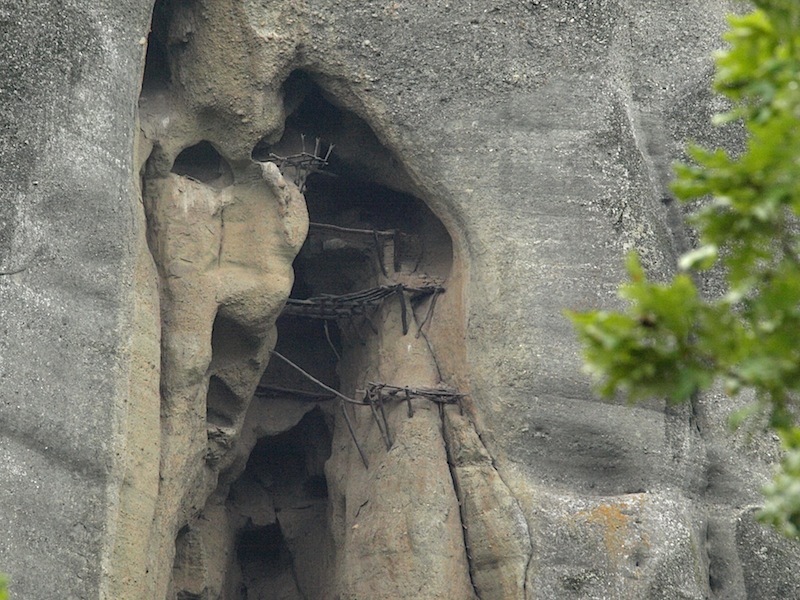 The more difficult it was to get into the cave, the safer it was for the inhabitants. The next image shows the layout. 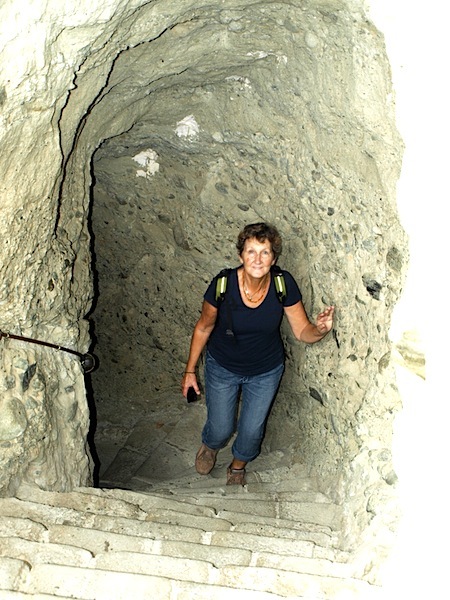 One of the many caves in which the monks first set up places of living and worship. Estate agents say ‘location, location. location’. This is the ultimate location. You wouldn’t want to be a sleep-walker though! There was an eccentric bloke living at Maydena in Tasmania who said, ‘The aliens are watching us all the time. They are everywhere’. He was referring to faces in the stone around the area where he lived. He would have no doubt have seen the faces in the rocks here. 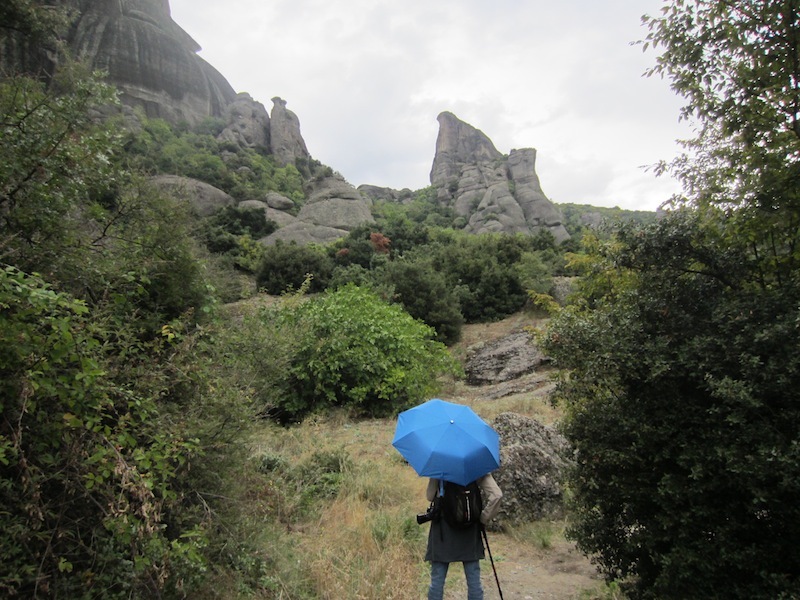 During WW2 the Germans bombed the monasteries on top of the pinnacles and many art works were stolen, never to be returned. The theft of Greek gold and art treasures is a sore point with older Greeks even today. Because the treasures were never returned they don’t feel too bad about accepting a German bail out in relation to the present financial crisis. They say they are only getting back what is rightfully theirs. 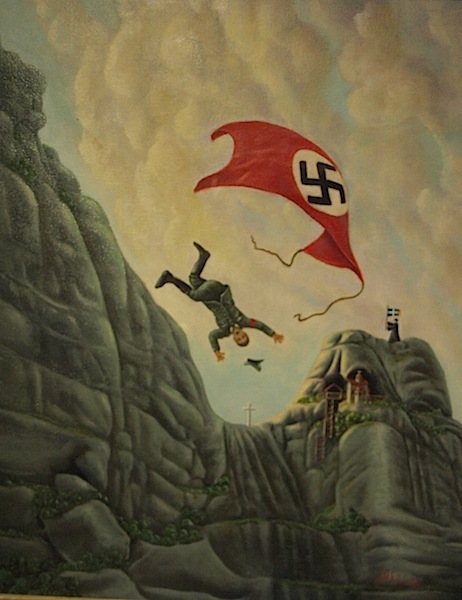 A painting of a Nazi falling to his death from the top of a rock. The caption under this image as best I could work out meant: another one bites the dust. View from a rest spot on the way up. Another view on the way up. 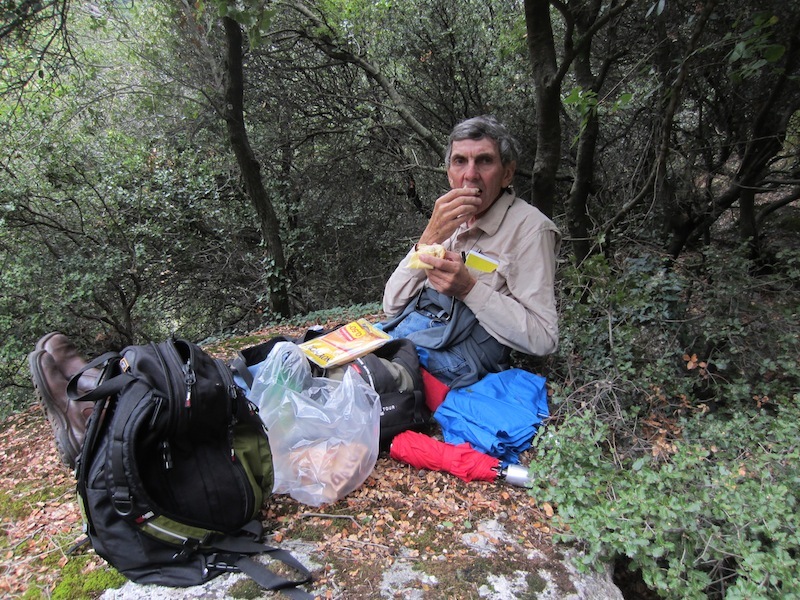 Time, when travelling as we are, can be broken into four categories and they are: sleeping, sightseeing & moving, eating or thinking about it and, finally writing and preparing this blog. 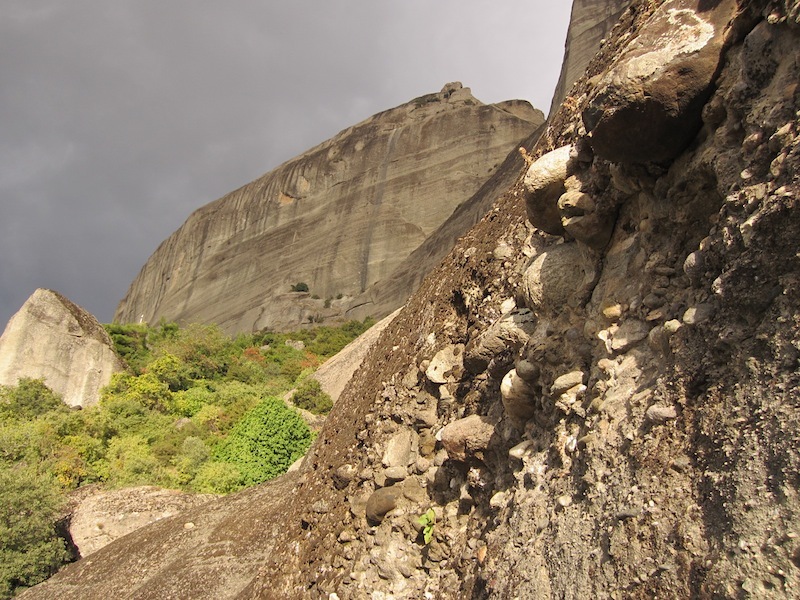 The pinnacles near the monasteries are popular for rock climbers as the water worn stones sticking out of the sandstones make great hand and footholds. If we were here in season and the adventure companies had been in operation I think I would have been prepared to abseil to the bottom. 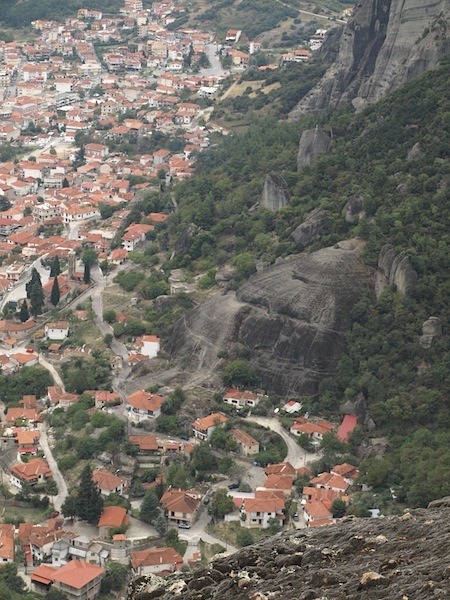 The monastery of the Holy Trinity sits about 550 metres above the town of Kalambaka. Not a bad climb for a couple of old donkeys. Bev coming through the tunnel of enlightenment. We came from down there. The track can be seen in the middle of the photograph. A view of the easy access from a car park to the base of the monastery. Note the lack of guardrails. It’s obvious you have to take responsibilities for your own welfare. 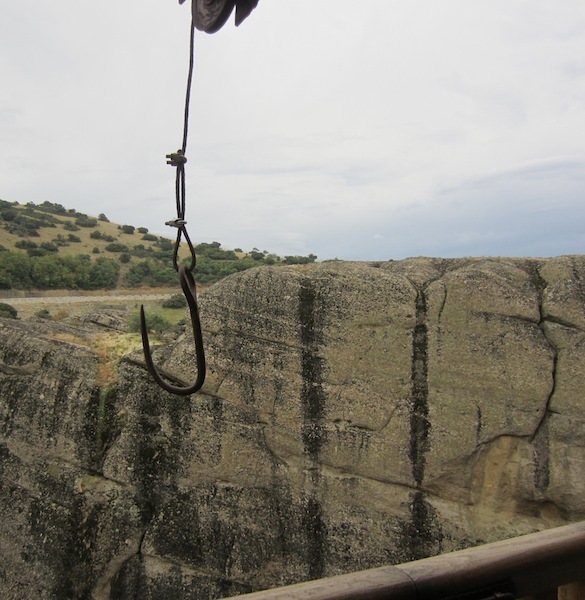 I bet there have been people go over the edge though. 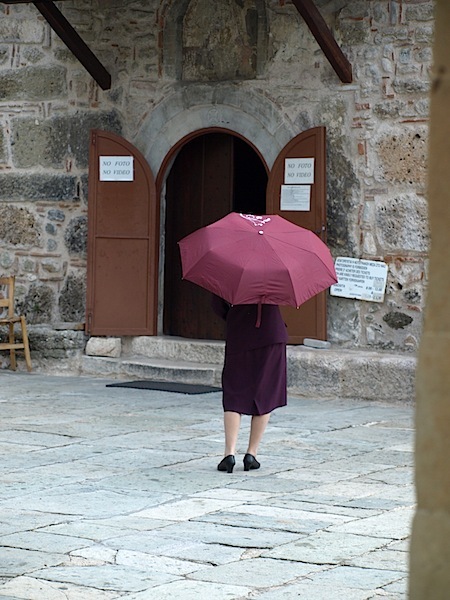 When visiting the monasteries it is necessary for women to wear a skirt. Because most female tourists tend to wear pants, wrap skirts are provided. Pants apparently are for men! A long way up or down. 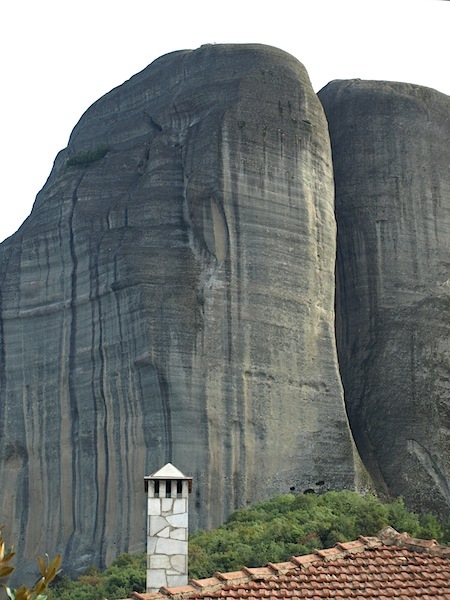 The question is, how did the monks get themselves to the monasteries if there were no ladders or stairways? The following images explain all. 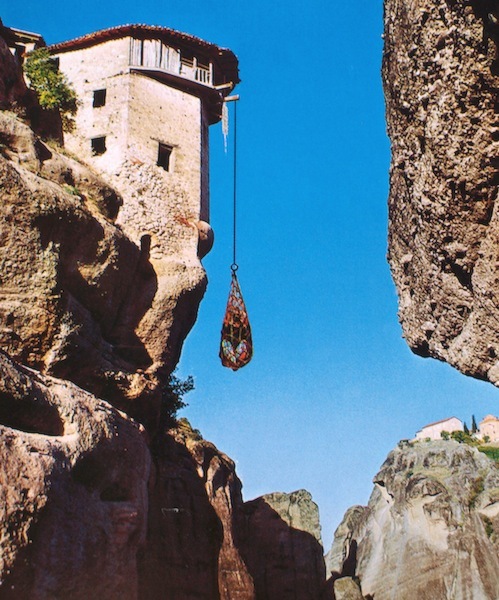 This is how the monks transported themselves and goods to the monasteries. The following set of photographs show the winch end of the lifting rig. The net in which monks and goods were lifted from ground level to the loading platform. In the background at floor level is the bearing pivot point of the spindle. Shafts were slotted into rectangular holes in the drum. 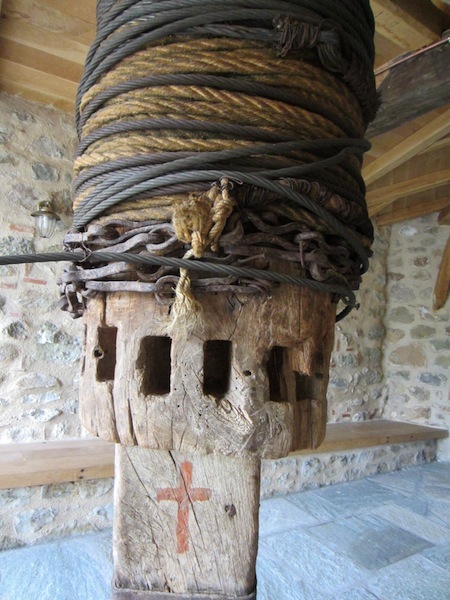 Monks took hold of the extended ends of the shafts and pushed and as the drum turned it wound the rope around the drum and lifted the rope basket from ground level to the landing platform. The wire rope is a recent innovation. 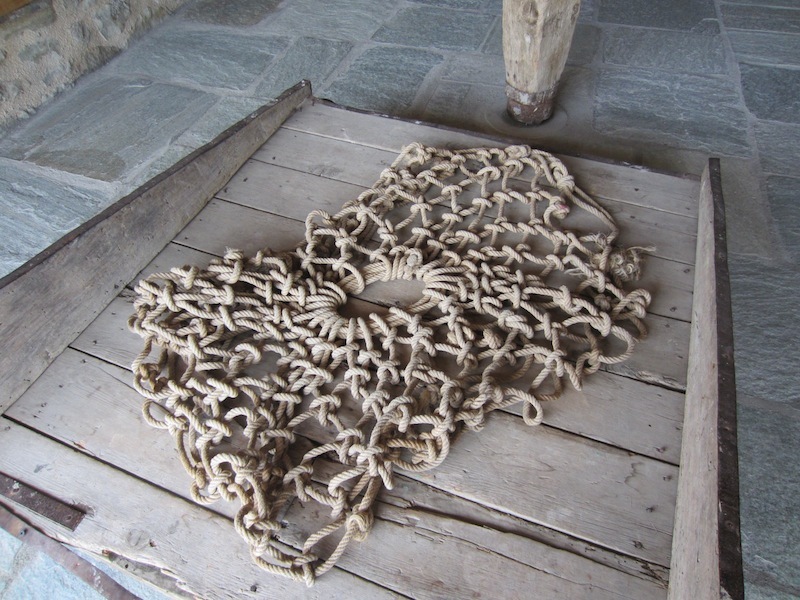 In early days a sisal rope would have been used. I’m not sure what part the long link chain played in the apparatus. I assume the Latin cross blessing on the spindle made sure every thing went to plan. If it didn’t the load in the net (sometimes human) would plummet to the ground below. Today a flying fox is used. Wire ropes are stretched from pinnacle to pinnacle. The man in the box here winched himself across. 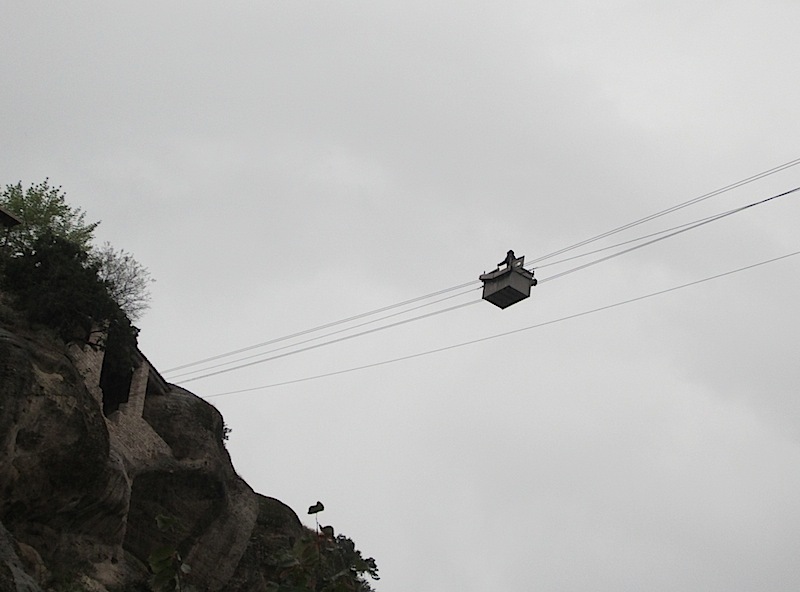 It looked safe enough but I think you need nerves of steel for this activity just the same. 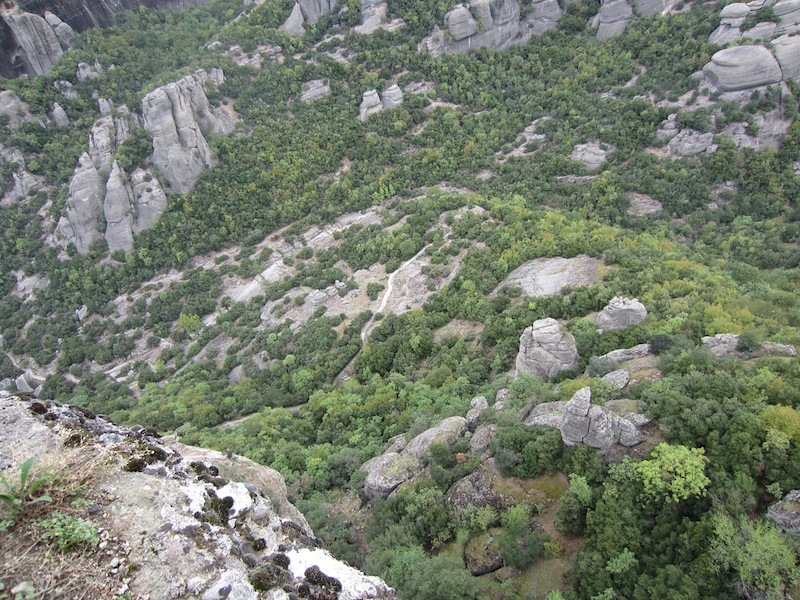 View of the other monasteries. 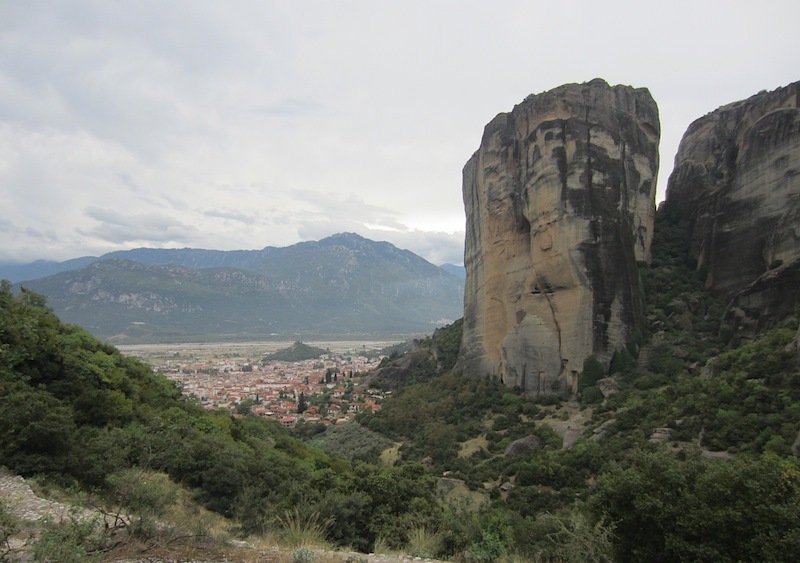 After one last view towards the other monasteries of Meteora we set off on the return trip to Kalambaka. The return was rather taxing as doing seven kilometres downhill one’s legs have a tendency to turn to jelly. However any inconvenience was allayed by the experience of treading in the footsteps of monks who made the trek thousands of years before. The sign that proves we did a fair walk today. If you take into account our pre-breakfast walk we probably walked about 18kms today. 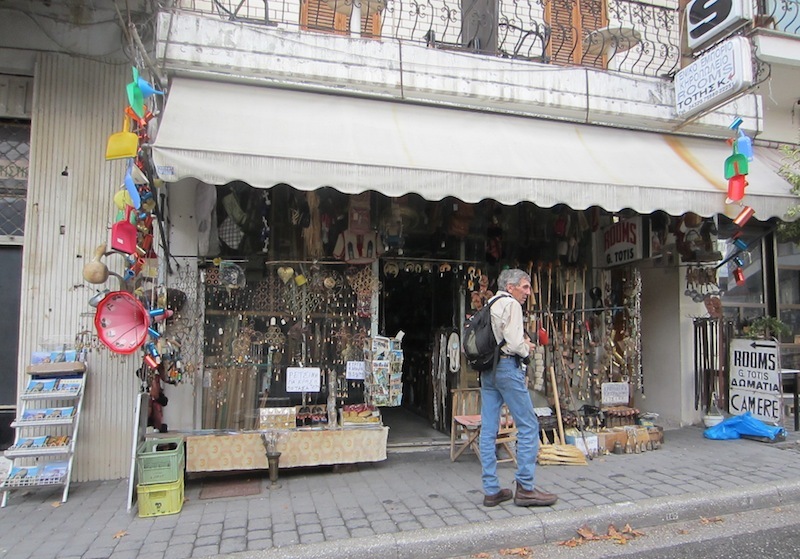 On the way back through the village we found a treasure, the ultimate junk shop. At first I thought it a simple village store but inside it was a Pandora’s box. 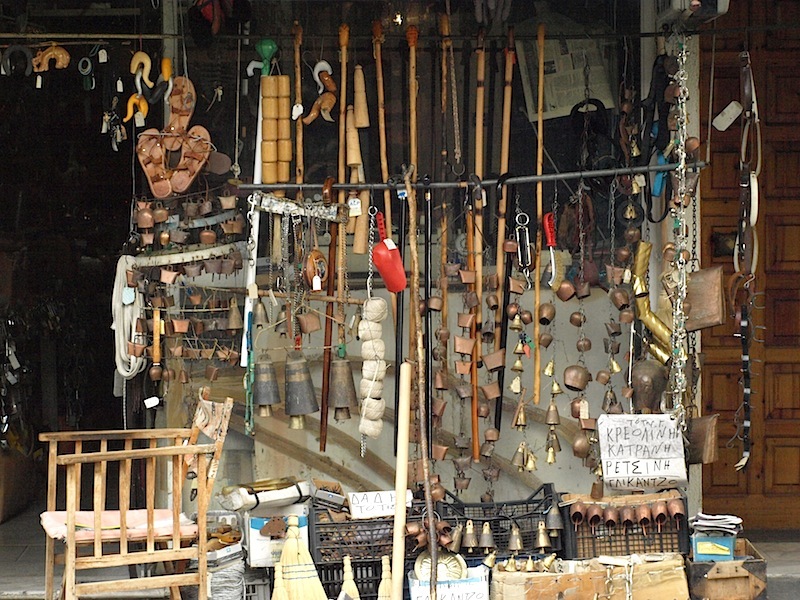 Whatever you wanted was in this shop. 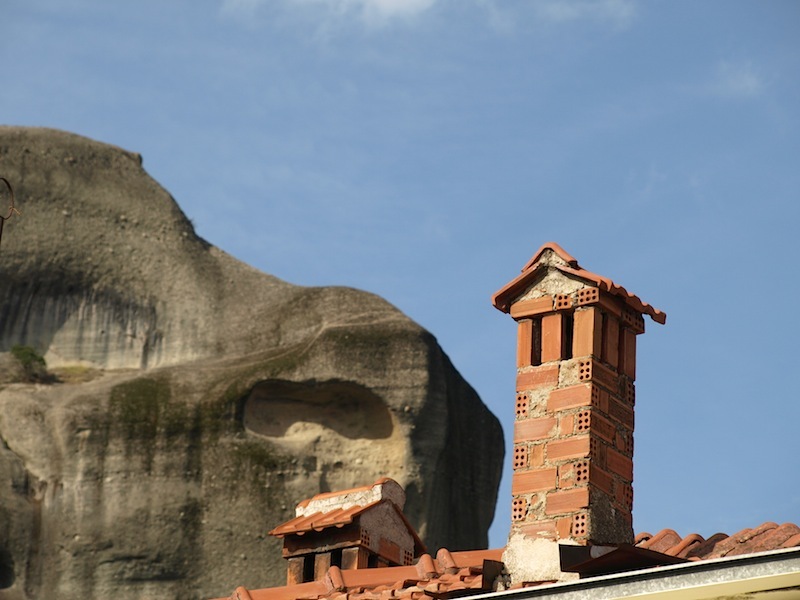 There were a lot of other treasures to be found along the way, such as chimney pots. 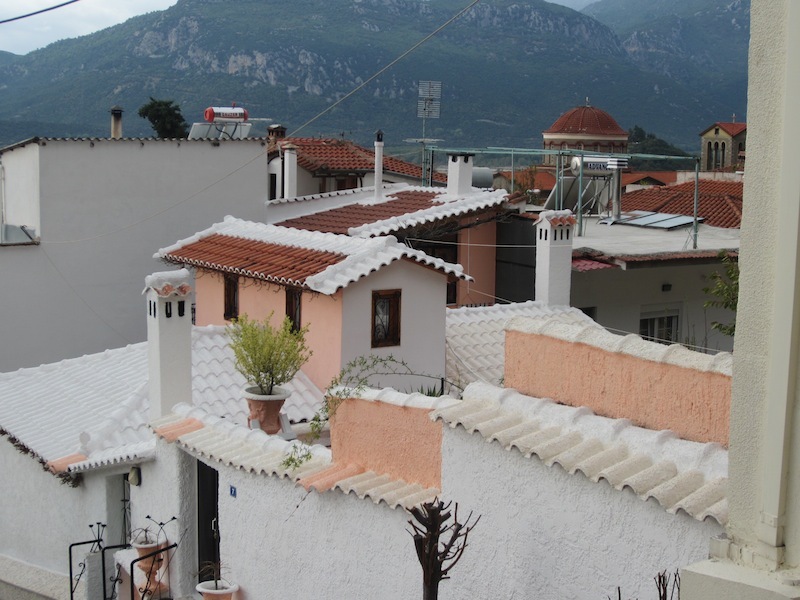 I am having a fixation about chimney pots. Every one is different, reflecting the personality of the builder. The following images show what I consider ones with attitude. Well-built and clad with broken tile pieces. 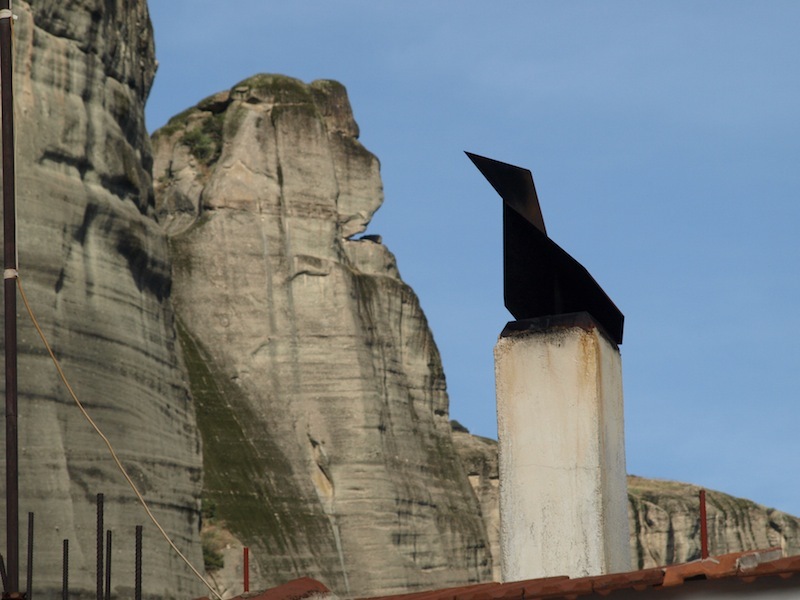 This one in the shape off a bird looks like it is about to fly to the top of the mountain. How would you like these mountains in your backyard? 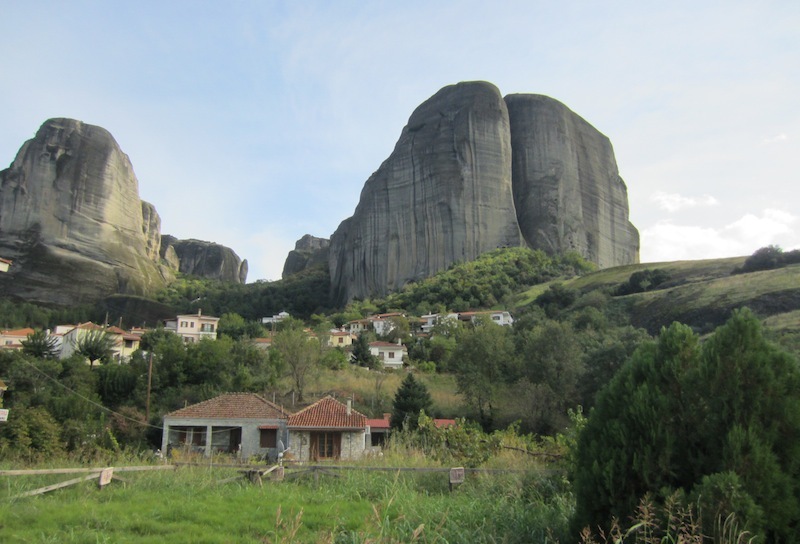 Tomorrow we catch a bus to the top of Meteora where we visit the grandest of the monasteries, the Holy Monastery of Great Meteoron. Wouldlove those mountains in my backyard. This is my favourite post yet. spectacular scenes and pics Bella reckons they are all beautiful photos!! Spectacular views! Wow, very special, very wishing I was traveling with u 🙂 and impressed with the hike Fred!.